Photo: Meet Khao San Road. Fifty years ago, Khao San Road was known locally as a good place to buy rice. Today, it’s the most famous backpacker ghetto in the world. This notorious strip of cheap digs and bars was originally projected into fame by pot-smoking hippies ambling their way along the four Ks of Kabul, Kathmandu, KSR and Kuta back in the 1970s. Despite its complete transformation since then, Khao San’s exotic allure has stayed alive in traveller imaginations, fired partly by the decent book-turned-rather-lacklustre-film, The Beach. Modern Khao San is a hub of somewhat crazed activity that reminds us of the scene at a free-flowing music festival, but with a lot of tuk tuks. It’s home to dizzying neon lights, dusty silver shops, persistent touts, stalls selling everything from tie-dyed tank tops to fake Harvard masters degrees, ubiquitous pad Thai and fried bug carts, rowdy bucket bars, tattoo parlours that make a killing off people coming from the rowdy bucket bars, a fastfood joint or two and the occasional Thai granny who shakes her head at the hippies while remembering when it was still a quaint little rice-selling community. Khao San is heaven for some and hell for a few, but it’s worth a stroll at least once in a lifetime. It would however be unfair to label this whole area as a backpacker ghetto. Khao San Road itself is a fairly short street situated within walking distance of Ko Rattanakosin in the heart of the old city, known as Banglamphu. Although budget guesthouses and increasingly more upmarket hotels stretch outwards from Khao San for quite a way, the surrounding area is still one of the most charming and historic in the city. Running parallel just north of Khao San Road and continuing across Chakrabongse Road to the west is Soi Rambutri, which was the first neighbourhood street to be gobbled up by the backpacker craze and now feels like Khao San-lite. Beyond that, Phra Athit Road runs along the river and hosts artsy cafes and bars, laidback guesthouses and some fantastic hole-in-the-wall eateries. North of Khao San you’ll find a similarly low-key atmosphere amid the old city streets that meander up towards Dusit. A stone’s throw to the south of Khao San is one of Bangkok’s other most famous roads, Ratchadamnoen, which was built by King Rama V in 1899 to connect the Grand Palace to Dusit Palace. In a roundabout at the centre of this 10-lane road and not far from Khao San is Democracy Monument, an imposing symbol of Thailand’s switch to a constitutional monarchy in the 1930s that has since become more symbolic of the Thai people’s struggle for democracy. Pro-democracy Thai demonstrators perished here at the hands of Thai military in 1973, 1992 and 2010. South and east of Ratchadamnoen are several canals that mingle with centuries-old streets like Dinso, Bamrung Mueang and Tanao, and major historical landmarks like the Golden Mount and Giant Swing. Many of these old roads are lined with attractive two-storey heritage shophouses which are often still devoted to a single trade or product, such as wooden furniture or temple supplies. Don’t settle for overpriced, watered down Thai food on Khao San; some of the best food in Bangkok can be scored from simple shops and street carts on Banglamphu streets like these. As for Khao San Road itself, many choose to stay here simply due to convenience. Travel agencies will accommodate any imaginable need and it couldn’t be easier to find internet, laundry and cheap beer. Plenty of travellers stay for a lot longer than originally planned, enjoying the whole "I’m-a-traveller-not-a-tourist" scene. If you’re young, on a budget and looking to mingle with other backpackers, staying around Khao San at least once is a no-brainer (just keep an eye out for scams). But keep in mind that there are other parts of Bangkok that have some fantastic guesthouses and all the services a traveller needs. One more point to consider before committing to Khao San: while not far from most of Bangkok’s most popular tourist sites, this area is several kilometres from the nearest BTS (sky train) and MRT (subway) stations. A Chao Phraya express boat pier and canal boat taxi pier are both within walking distance, but most who stay at Khao San rely on tuk tuks and taxis to get around. Browse our independent reviews of places to stay in and around Khao San Road. Read up on where to eat on Khao San Road. Check out our listings of things to do in and around Khao San Road. 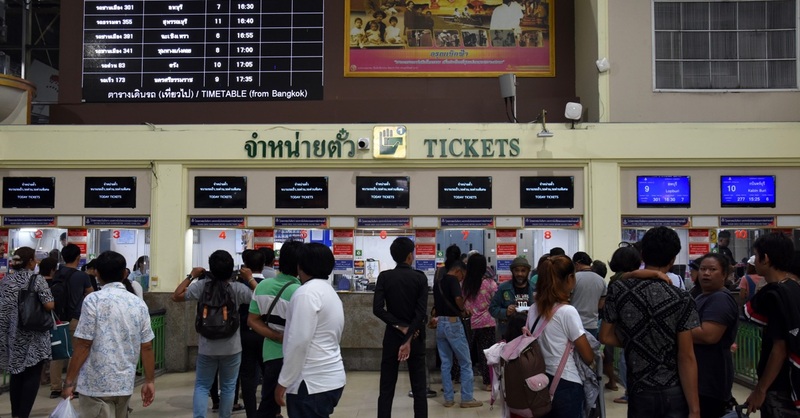 Read up on how to get to Khao San Road, or book your transport online with 12Go Asia. Planning on riding a scooter in Khao San Road? Please read this. Use the above map to find specific destinations in and around Khao San Road which are listed on Travelfish. Bed icons indicate a guesthouse, hostel or hotel, the knife and fork is an eatery or bar and the four-way circular thingy marks sights, attractions and other points of interest. Click on any icon for a short pop-up and a direct link to the page for that spot. If you are in the area, use the teardrop icon near the top left to show your position on the map (you'll need to allow position sharing for this last feature to work).